UPDATE: Chupy has been located and is now in an animal hospital. 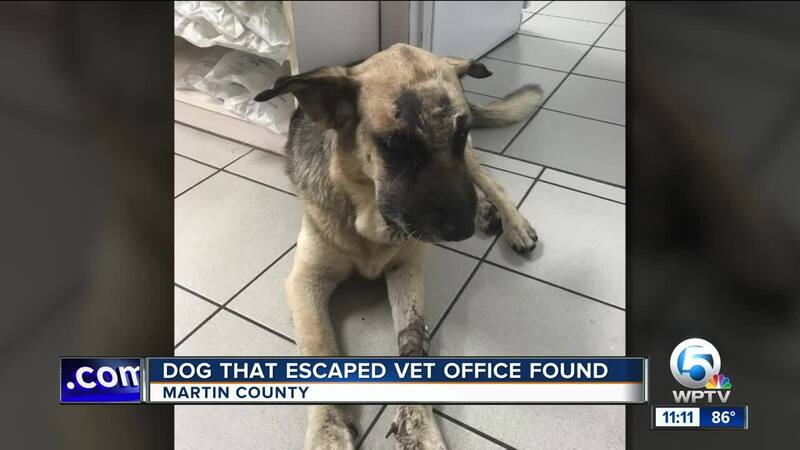 The Martin County Sheriff's Office said Chupy was reportedly dehydrated, but otherwise doing well. She was located on the railroad tracks not far from the original location, according to a statement from MCSO. People in Jensen Beach continue to search for a dog that got loose from a local animal hospital. 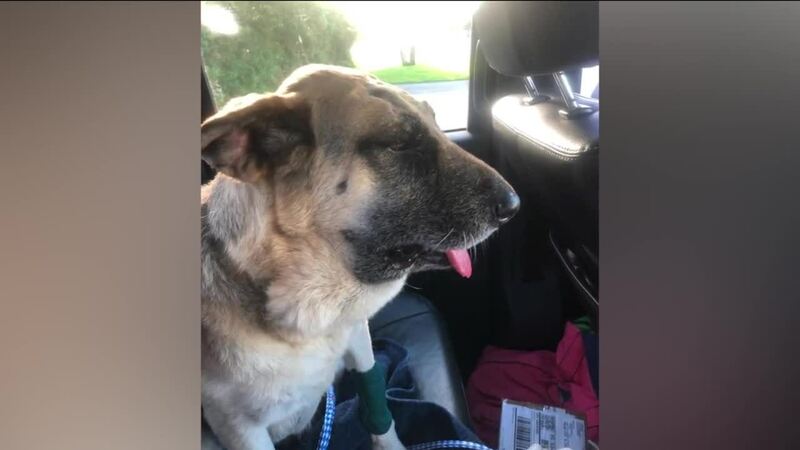 Chupy, an 8-year-old German Shepherd, was being treated at Savanna Animal Hospital after being bitten by a rattlesnake. Chupy’s face was swollen, and she had an IV line still in her arm when she escaped. She had already received two treatments for the snake bite, but still needed more time to recover. Staff at the animal hospital said Chupy likely got spooked while she was outside in a fenced in area. They say someone locked a child in their car accidentally in the parking lot. Law enforcement showed up, and staff believes she got spooked by the commotion and lights in the parking lot. The gate was left unlocked by lawn care workers, allowing her to get loose and bolt across Savanna Road. Veterinary staff were among the many out searching Monday for Chupy. Others were concerned residents who had seen the Martin County Sheriff’s Office Facebook post about Chupy, shared more than 6,000 times Monday night. They’re hopeful to find Chupy safe and alive, possibly in the back of the many wooded areas near the animal hospital. "I feel so bad for the family,” Grant said. “I love her, there’s 4 dogs at the barn and she’s just, she’s my buddy,” said Chupy’s dog sitter Tara Daniele. She said Chupy is nervous, and had an abusive background before her current family rescued her. “I hope she’s resting a little bit because she isn’t feeling real good. Maybe when she’s a little stronger she’ll venture out,” Daniele said. She also said Chupy’s family recently moved to Palm City, so she worries Chupy is too far from his new home to make it back without help. If you see Chupy, contact 305-522-3149 or 786-402-1915. You can also contact the Martin County Sheriff’s Office non-emergency line at 772-220-7170. She is very shy, has a bandage on her front leg and a swollen face from the snake bite.